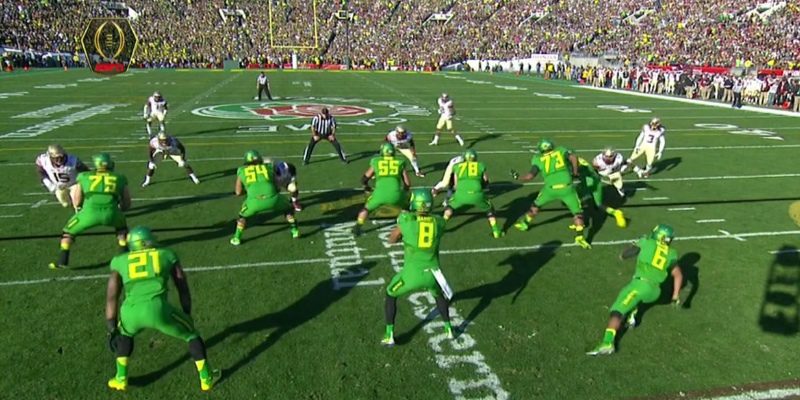 How will Oregon attack Ohio State in the National Championship Game? It is an interesting question to ponder as Rory Davidson and I of FishDuck.com (who have been creating analyses throughout the season for this site) sat down to discuss it yesterday. While there are many technical aspects within the Oregon offense and defense that could come into play, we agreed on five concepts/strategies for the Oregon fan to keep an eye out for as the game progresses. Charles: There are so many strategies that Oregon has used in the past to surprise opponents that it is hard for us and the opposing coach to guess correctly as to which one(s) we will see. A fun surprise in the past has been watching Oregon spring the unbalanced line formation out during the game, which turned the tide against Stanford in 2011, USC in 2012, and UCLA this season (2014). A screen pass with an unbalanced line? Not fair! It is especially lethal when Oregon is running its fast tempo and the opponent does not recognize or have time to line up right. Touchdown baby! 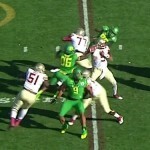 Can the Duck LBs get to OSU? Rory: If you read my article on Ohio State’s strengths, you know that the Buckeyes’ offense is a mirror image of the Ducks’. Because of this, I think that the Ducks are going to look at film from their own game against Arizona this year to see what Zona did to stop the Duck offense. They’ll find that Arizona blitzed and stunted often. So I would think that since Cardale Jones is young and inexperienced and that Arizona was successful doing this against the Ducks, the defense is going to want to blitz. They must be disciplined though, so not to let Jones scramble for a first down, as he has done so often in his two starts. Charles: The depletion of Oregon’s receiving corps has been well documented by the media as the loss of playmakers such as Devon Allen and Darren Carrington cannot be minimized. Yet Oregon still has three superb tight ends who may help compensate for the loss on the outside, and one method is to line up in the THUD formation with a TE flanked out wide. In the passing game it wastes a corner covering a TE, which should open up opportunities, with a safety or LB covering a faster WR. In the running game we will see the TE go out and pulverize the smaller corner, which should open up some nice running lanes to the perimeter. Don’t forget that Thomas Tyner lined up in the slot last spring for a touchdown, as few players can run with his speed in the open field. He is healthy and running him as a slotback or on a wheel route out of the backfield could burn the bigger, but slower Buckeye linebackers. Rory: On the offensive side of the ball, Charles and I agree we’re going to see Mariota carry the ball more since this is the last game and there is no tomorrow. Ohio State’s defense swarms to the ball and sometimes jumps to conclusions too fast, especially when defending the read option. The Buckeyes’ defense has a star in defensive end Joey Bosa (No. 97), who can be a game-changer, but the linebackers will often commit to stopping one aspect of the game, such as the running back or the passing game. So, look for the Buckeyes to take away Royce Freeman and Tyner’s running lanes, leaving some holes for Mariota, at least until Coach Meyer makes adjustments. Charles: Something that I guarantee we’ll see is the use of at least one old play out of the playbook to surprise the Buckeyes in this National Championship Game. This strategy has been a staple in big games with both Chip and Helf, and it is impossible to know which ones to look for. My favorites from this year was the introduction of the Pistol Formation for Washington, and dusting off the Speed Double Option play from four years before. I doubt we’ll see those again because there are so many plays to choose from and a trick play or two for this game would fit within the game plans that the Helfrich/Frost duo have assembled before. Personally, this is one area I cannot wait to see, and I guarantee we will see one if not many plays from the recent or distant past. Fun stuff! Mixing it up with the Pistol formation! This has been enjoyable trading notes with Rory, and for fans who want some analysis after the game? Do check FishDuck.com as analyst Alex Kirby and I will offer some feedback this evening as well as delve further into game analysis the next morning in the usual Tuesday football analysis.